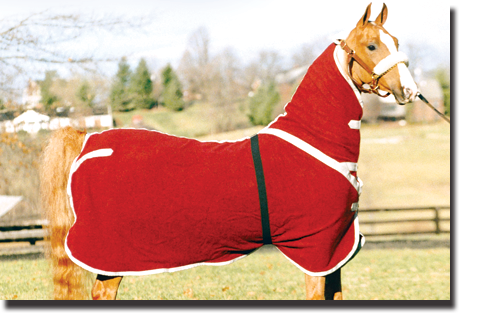 The RaDon Classic Show Cover reflects your commitment to the very best in show horses. When you are ready to make your move to the show arena, a custom monogrammed RaDon Classic Show Cover radiates the tangible charisma and confidence of a grand championship contender - deserving of privilege, worthy of protection. Our Classic Show Cover features a full-body custom-tailored fit with three quick fasteners in front and a hidden surcingle to keep it in place. The right color, flashy texture and unmatched durability of Arctic Nyl keep the Classic Show Cover looking fresh and new season after season - making it the perfect complement to your winning presentations. A RaDon favorite. As a true working tool for the equine professional, nothing beats the versatility and service performance of the RaDon blended Wool Cooler. Wool provides warmth and protection while it naturally draws moisture out and away. 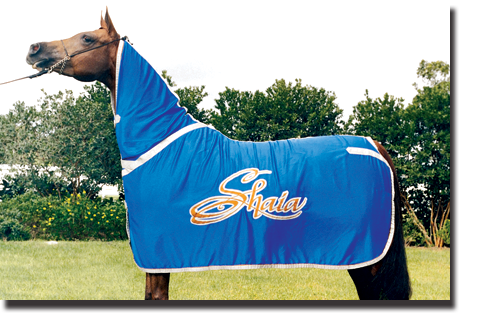 It keeps horses dry, clean, comfortable and warm after a workout or bath - even in cool barns. The natural wicking action, warmth and durability of wool make it an ideal multi-purpose Cooler. 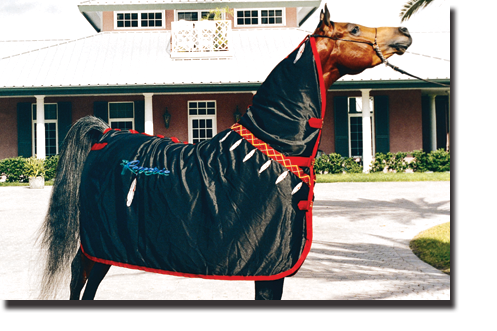 Pro Trainers even use the RaDon Custom Fitted Wool Cooler with exterior elastic belly band (shown) to work show horses under cool conditions - and it will stay in place. Coolers are available in square or custom fitted designs.